Residents and activists protest at the city forest in Noida. Someone was axing their forest. 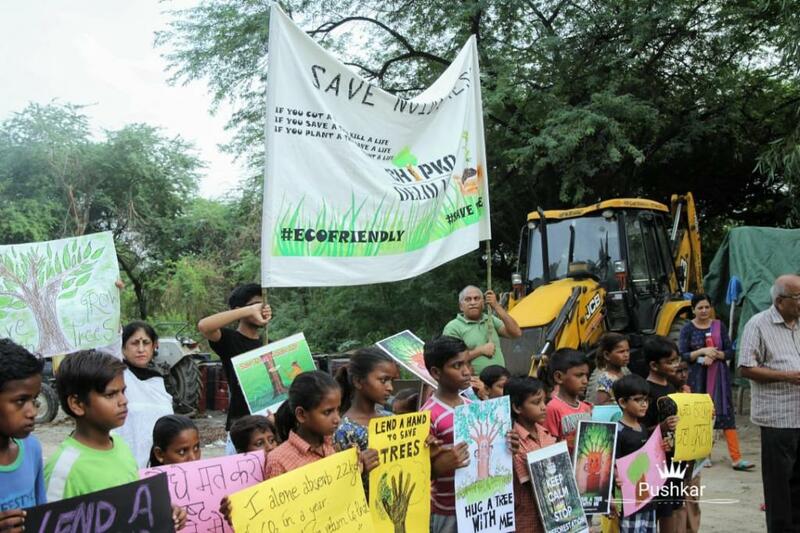 Residents, environmental activists, NGOs, resident welfare associations (RWA) and the civil society, all recently came together in Noida against the indiscriminate felling of some 3,000 trees. They were alarmed to see rampant felling of fully grown trees and a lot of this being done at night to evade attention. Result? Around half of the tract land, which was earlier under lush green cover, had been shaved. Sadly, the draft 2031 Master Plan for Noida shows the city forest, situated in Sector 91, as a recreational park and playground. Since Noida is a part of the National Capital Region (NCR), it must conform to provisions of the NCR Plan.In the Master Plan of 2021, the land is a ‘City Forest’. The NCR Planning Board is making a Master Plan for 2041. The Noida Authority seems to have different plans. Its present draft plan has “mandated” that the 75-acre parcel of forest land “be developed as a“Biodiversity Park”. The National Capital Region Planning Board (NCRPB) must question this unilateral way of functioning. If Noida Authority gets its way, it will be the death of the city forest, which is Noida’s only remaining green lung. The fear isn’t unfounded as, according to the District Forest Officer (DFO), 2,994 standing trees have already been axed, a contract for which had been issued with a deadline of August 25. And, what’s alarming is that 6,000-10,000 more trees are feared to meet a similar end. This made local residents upload a petition on change.org. The Residents’ Association of Forest Spa, an upscale residential complex, filed the petition on August 21 after the residents saw the wanton desecration from their high rise. Another was filed by public group DelhiChipkoNCR. Over 2,000 people, not all of them from Noida,have signed. A Chipko-like agitation erupted in protest at the forest site. In response, the authorities steered the conversation towards question of how good or bad is it to plant Eucalyptus. The residents and activists appealed that thefocus remain on land use and “the forest should be allowed to remain a forest”. Noida Authority’s attempt to dilute the issue by talking about Eucalyptus was exposed when a copy of the July 2018 contract,issued to a private party,showed that the order to fell trees didn’t make any distinction between “standing” Eucalyptus trees and so-claimed “falling” or “overgrown” ones, or even other varieties of trees. The felled trees included Eucalyptus and few protected tree species including Neem. 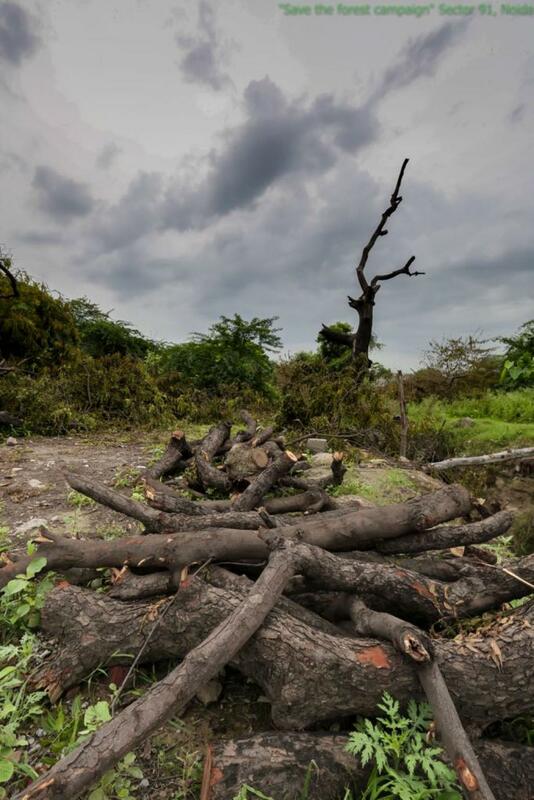 This was in violation of the Uttar Pradesh Protection of Trees Act, 1976, and a notification dated July 20, 2012, that clearly states that seven tree species, including Neem, cannot be felled till December 31, 2020. The forest department too has complained against this. Despite the people’s movement gathering momentum, the Noida Authority, in its statements to the press, reiterated that they will still go ahead and construct concrete roads, cycle tracks, parking areas, and a host of structures like an amphitheatre, multipurpose hall, artificial lakes and fountains etc. This made activists even more agitated and on August 25, they came down in huge numbers, held posters, formed a human chain, hugged trees and even observed vrikshabandhan by tying of sacred threads on tree barks. They demanded that the identity and integrity of the forest be maintained “in name as well as spirit”. Citing Article 51-A(g) of the Constitution of India, they said it is their fundamental duty to raise their voice against the usurpation of a forest. In damage control mode, the Noida Authority called for large-scale replantation on August 29. This was also when the park-playground of the draft Master Planwas publicly anointed as a biodiversity park. The charade was such that while several tractors ferried workers to the forest for the plantation drive, only two-odd tractors carried young tress and saplings. Many officials also rallied in support of the authority. Netted shrouds over the felling machines, heavy equipment and piles of concrete presented a false green picture. This didn’t affect the stand the concerned citizens had taken. They still stood firm on their demands that no more trees should be axed in the forest without irrefutable scientific basis and a transparent plan should be put in place to replace lost trees with those of forest variety. Since Noida already has enough parks that need maintaining, priority should be given to their upkeep, instead of creating another concrete park and the forest should be protected against encroachments and sand mining. It’s not just about trees, the forest is also home to different species of animals such as Nilgai and more than 50 varieties of birds, including peacocks. The Nilgai is a protected species under Schedule III of the Wildlife (Protection) Act, 1972 and Peacock Pheasants as well as Peafowl are protected under Schedule I of the Act. Different species of butterflies also abound in the forest proving its importance as a living and thriving ecosystem. Driving out the wildlife to find shelter in neighbouring parks is unsafe for both the animals and the residents. “Wildlife habitat is irreplaceable and once a forest is transformed into a concretized park, we will never be able to gain that forest back,” says a protestor. The #SaveNOIDAForestCampaign has gathered support from more than 24,000 residents in various housing societies. This clearly shows that the citizens have refused to be fooled. They have appealed to the UP government, Union Ministry of Environment and Forests, Noida Authority and the civil society seeking their intervention in preventing the creation of this biodiversity park in place of the city forest. Meanwhile, alocal activist has filed a petition before the National Green Tribunal (NGT), New Delhi. It was heard on August 31 by a four-member bench. Arguing before the bench, grievance was pleaded caused to the residents and the animals by cutting down of 3,000 trees for developing a biodiversity park, while violating environmental laws, including Environment (Protection) Act, 1986 as well as Biodiversity Act, 2002. The tribunal has called for a factual report on the project from the DFO, Gautam Budh Nagar, Uttar Pradesh. The matter will be next heard on November 14. Since then, certain media reports have said that permission to axe 1,000 more trees have been either “revoked” or put “on hold”. No copy of the official confirmation of this is yet available.While further legal recourse is being explored, several pairs of eyes watch over the forest. ALARM ! -- Wildlife experts have warned again that presence of the last surviving Asiatic lions at 'one place',in GIR forest, could be dangerous in case of a viral epidemic. Union and State Forest ministers must look into this quickly. Relocate 10 lions to Sariska and 10 to Kunho too. First check if good habitat in Sariska forest. Kindly move out the 11 tigers from Sariska to Ranthambhor or another reserve. Keep a gap of 7 days then bring the 10 lions there, if feasible !!! News - Stunned by the deaths of 23 lions since September 12 in Gir forest in Gujarat!